This is a 1918 Parker “Black Giant” eyedropper-filler in Black Hard Rubber. Parker’s first “Giant,” the “Red Giant,” introduced in 1909 at $10, failed because the cap was too brittle and Parker was losing too much money honoring their warrantees. This was less of a problem with the “Black Giant,” introduced soon afterwards. These are found clipless, with a “split” clip (open in the back), and a full washer clip (such as this model. They also are found with no cap imprint, like this example, and with a “Parker Black Giant” cap imprint. The pen also came in two lengths; this being the longer version. 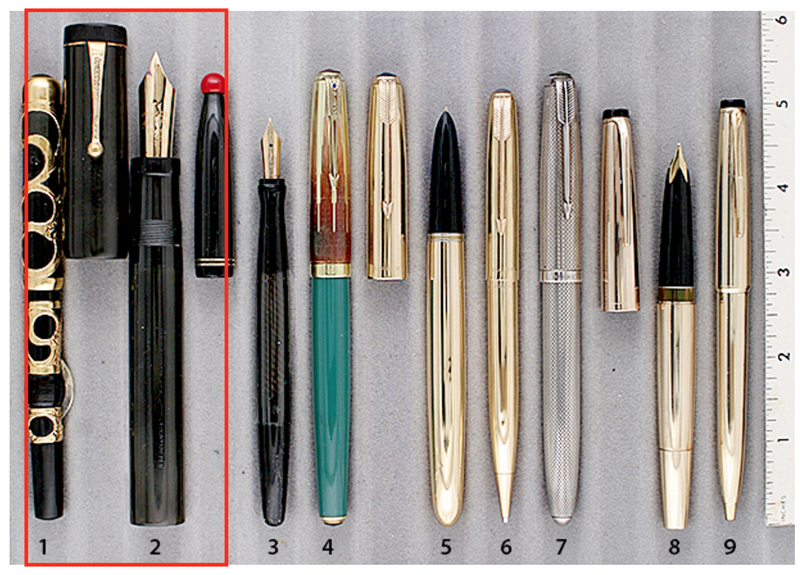 The huge #12 nib is a sight to behold (medium). Very rare, very beautiful and very desirable! Item #2 in Catalog #81. This entry was posted in Vintage Pens and tagged Parker. Bookmark the permalink. Follow any comments here with the RSS feed for this post. Post a comment or leave a trackback: Trackback URL.